An Iranian man casts his vote in the parliamentary elections on March 14 in Tehran, Iran. Iranians have begun to vote in elections in which reformist opposition have been barred from running against President Mahmoud Ahmadinejad. As the three remaining presidential candidates begin staking out their positions on important foreign policy issues facing the country, each will have to explain how they plan to deal with an increasingly powerful, increasing belligerent Iran. It is no exaggeration to say that America's relations with the Islamic Republic hinges on who will be the next president and commander in chief. Iran is having an election, too. 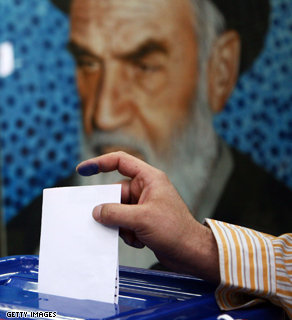 But unlike the primary season in the United States, Iranians do not support the ballot choices offered to them by the regime of the Islamic Republic. A new nationwide public opinion survey of Iran conducted by Terror Free Tomorrow and D3 Systems shows widespread disillusionment with the candidates running in the Parliamentary elections on March 14. When asked which candidates they plan on supporting – whether Reformists or Conservatives – a third of Iranians replied "neither," while a quarter said they do not know.